Posted by Leigh-Anne Biossat in Uncategorized with 0 comments. Today we highlight one of our veterans, Ms. Ruby Comoletti. She served in the United States Naval WAVE program from 1944-1945. Comoletti, a native of Donaldsonville, is a World War II Honoree Veteran. She was honorably dishcharged in 1945 after serving with ONOP New Orleans, LA, NTS Hunter College N.Y., NAAS Saufley Fld, Pensacola, FL, USNH Pensacola, FL, NAS Pensacola, FL. The United States Naval Reserve (Women’s Reserve), better known as the WAVES (for Women Accepted for Volunteer Emergency Service), was the branch of the United States Naval Reserve during World War II. It was established by the U.S. Congress and signed by President Franklin D. Roosevelt in 1942. This authorized the U.S. Navy to accept women into the Naval Reserve as commissioned officers and at the enlisted level effective for the duration of the war. The purpose of this law was to release officers and men for sea duty and replace them with women in shore establishments. Many female officers entered fields previously held by men, such as medicine or engineering. Enlisted women served in jobs from clerical to parachute riggers. Ms. Comoletti served with honor alongside many of our country’s WAVE servicewomen. We are proud to have served Ms. Comoletti and her family. 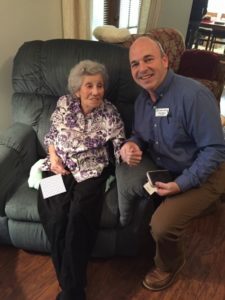 She will be remembered with distinction and gratitude on behalf of the Clarity Hospice Family.